You will set up a Windows server in AWS as a member of the Windows support group. The development team will then deploy their application stack for testing. Select the Windows 2012 Server Configuration as 2 vCPU and 80 GB General Purpose SSD. As a member of the monitoring team, you will navigate activities using the CloudWatch Service in the AWS Management Console. 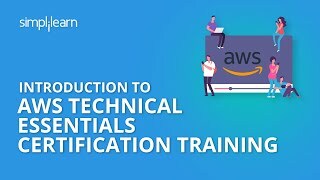 How do you become an AWS Technical Essentials certified professional? AWS certification exams are administered at Kryterion testing centers in more than 750 locations worldwide. The registration fee for the Associate Exam is $150 (USD). The Professional Exam is $300 (USD). Basic knowledge of any programming language is beneficial, but this course can be taken by anyone who has an interest in learning AWS. How will you complete course projects to earn the certificate? Upon completion of the AWS Technical Essentials training, you must submit a project to be evaluated by the trainer. Once your project is successfully evaluated and you complete the online exam with a minimum score of 60%, you will receive the course completion certificate from Simplilearn for AWS Technical Essentials. Note: You will be able to submit your project through the Simplilearn learning management system (LMS). You must complete 85% of the course and complete one project and one simulation test with a minimum score of 60%. this is good for all who want to start learning AWS. The course is extremely details and well structured. The articiulation with Demo is extremely helpful.